On Friday, February 17th I was walking in Mittineague Park, accompanied by sunny, bright, blue sky. The day was sublime. For some reason, unknown to me, I stopped by the central meadow and looked up into the sky and then over to a barren maple tree. 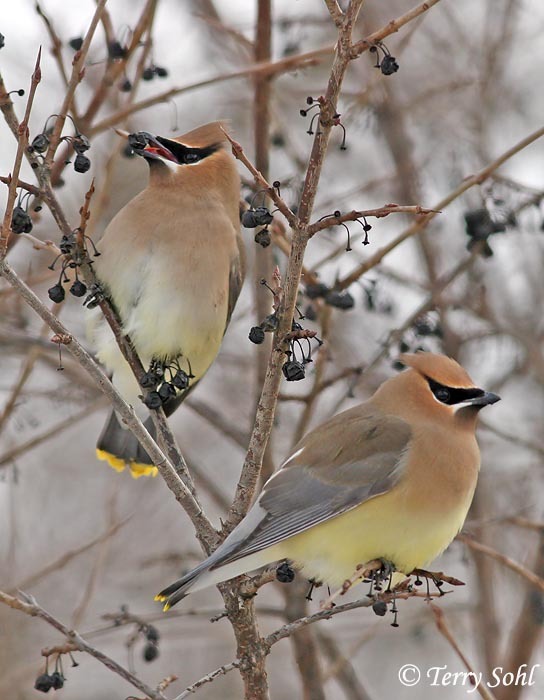 And there to my surprise was a small flock of Cedar Waxwings, perched not too close together, and not making a sound. The silence was stunning, like I was witnessing something special. The birds were facing south by west facing into the sun, appearing perfectly content. Their features were clear and sharp. The tufted cap, black mask and some smooth gray reminding me of beech bark. Most were preening themselves and a few were fanning their tail feathers, revealing that bright band of yellow. The birds seemed very calm and content not bothered by my stopping so close. The time spent there seemed magical.